This natural product with Natural Extracts penetrates deep into the skin rejuvenating the cells and thereby reducing the appearance of age spots. 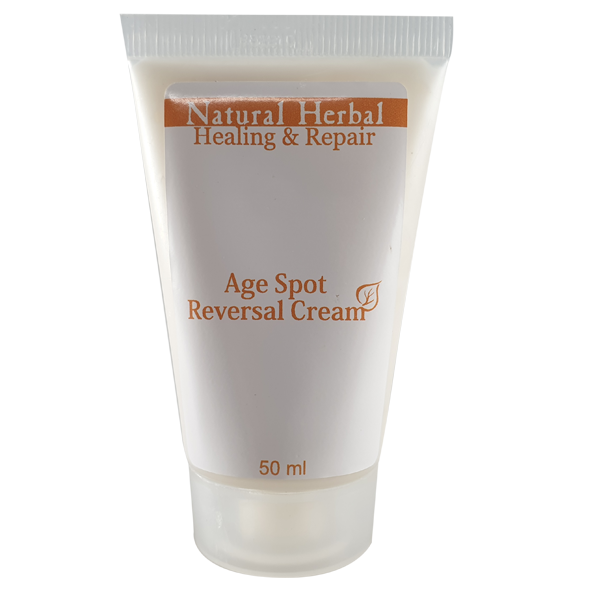 Healing & Repair Range Age Spot Reversal Cream contains Mallow extract which has extraordinary anti-inflammatory benefits, reducing puffiness and enhancing cell regeneration. Containing Peppermint leaf extract, it improves the elasticity of the skin, and through the introduction of vitamins contained within this extract, it brightens the complextion. Primula Veris extract reduces pores size giving the skin a smoother, fresher looking appearance. A dash of Alchemilla Vulgaris Extract softens dry skin and speeds up the repair of the skin cells. A high content of oil containing vitamins deriving from Veronica Officinalis extract stimulating cell growth and Kigelia Africana Fruit Extract naturally brightens pigmentation, reduces blemishes and increases blood circulation to the skin. Gently apply to the skin using the tips of the fingers, to all areas of the skin, but especially where required. Do not rinse off. Contains Mallow, Peppermint, Cowslip, Lady’s Mantle, Gypsyweed, Melissa & Yarrow Extracts. Reduces the appearance of age spots and brightens skin.